Like Romeo and Juliet, Hellelil and Hildebrand’s relationship was doomed from the start. 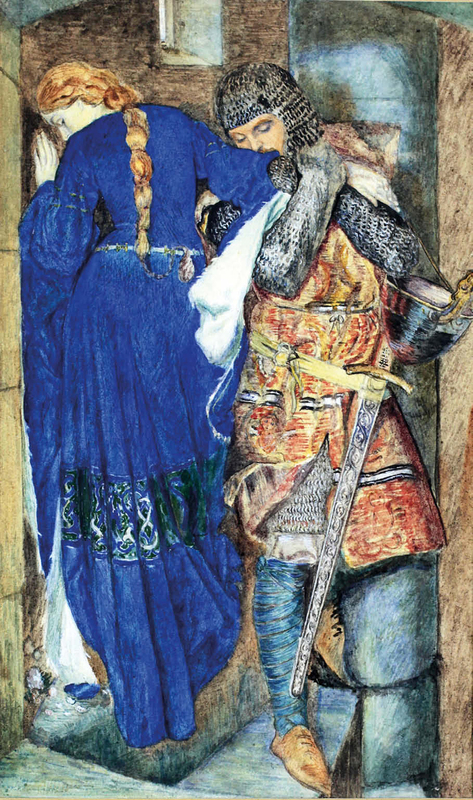 Hellelil and Hildebrand, The Meeting on the Turret Stairs, a preparatory watercolour by Frederic William Burton – €24,000 (£21,430) at Fonsie Mealy. Hildebrand, Prince of Engelland, had been employed as Hellelil’s personal guard. When her father discovers Hildebrand had visited Hellelil in her ‘bower’, he orders her seven brothers to kill the young prince. A fight ensues – Hildebrand manages to kill six of the brothers and Hellelil’s father before succumbing to his wounds. Hellelil meanwhile decides she cannot live without him. Easily the most famous representation of this violent medieval Danish ballad, translated into English by the Celtic scholar Whitley Stokes, was painted in 1864 by Irish artist and Pre-Raphaelite follower Frederic William Burton (1816-1900). Titled Hellelil and Hildebrand, The Meeting on the Turret Stairs, this large watercolour hangs in the National Gallery of Ireland and shows the star-crossed lovers sharing a fleeting moment of intimacy on a narrow stone stairway. In 2012, it topped a poll of Ireland’s favourite paintings and earlier this year was the star exhibit of the National Gallery of Ireland’s exhibition on Burton. Plenty of interest emerged therefore when a preparatory study of Hellelil and Hildebrand attributed to Burton was offered in a March 7 sale at Irish auction house Fonsie Mealy (20/25% buyer’s premium) in Co Kilkenny. Believed to be one of more than 20 preparatory studies Burton made, it was discovered in a well-preserved state on the top floor of a Georgian house in Ireland where it had been for 30-40 years. To the back was an old note stating it to be an original study by Burton and had been given by the artist to his cousin, Dr CE Fitzgerald. “We reckon this to be one of the final preparatory drawings he did because the colours correspond with the final work. In fact, this may well have been the one he actually worked from to make the large version in the National Gallery in Ireland,” said saleroom director George Fonsie Mealy. Estimated at €7000-10,000, it drew four phone bidders, commission bids, interest online and in the room before it was knocked down to a private Irish buyer on the phone at €24,000 (£21,430). It appears that no other drawings of Burton’s lovers have come to auction, although another watercolour draft depicting Hellelil in a green dress sold privately to the Boston College Museum of Art in the US. The same Georgian house was also the source of several Old Master paintings, including a 2ft 5in x 23in (74 x 58cm) oil described simply as by ‘a follower of Peter Paul Rubens’. Depicting a group of figures on a road in a romantic landscape, the canvas had some condition issues but was secured by a private buyer based in Madrid for €8500 (£7590) against a €5000-7000 guide. Equally sought-after was a smaller 14 x 18in (35 x 46cm) oil showing William of Orange at the Battle of the Boyne attributed to the Dutch painter Dirk Maes (1659-1717). It found a buyer just over top estimate at €7500 (£6700). 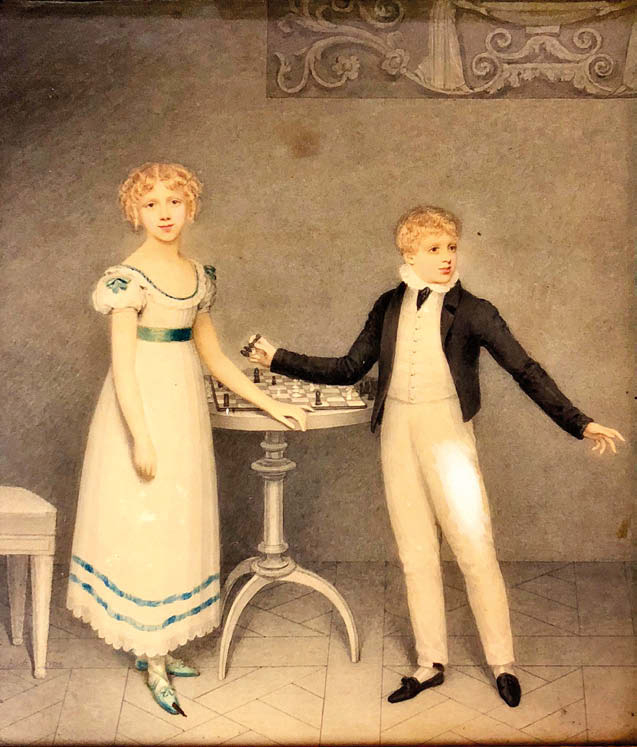 Lady Harriett Anne Gardiner and Luke Wellington Gardiner, Viscount Mountjoy, by Adam Buck – €3200 (£2860). Elsewhere in the sale, the appealing provenance of a well-known Irish estate helped the performance of a double portrait of two children by Adam Buck (1759-1833). The 14 x 12in (36 x 30cm) neo-classical watercolour had been in the collection of the important de Burgh family, responsible for designing a number of Dublin’s Georgian public buildings. The sitters were identified as Lady Harriett Anne Gardiner and Luke Wellington Gardiner, the Viscount Mountjoy who died a year after the portrait was completed. Provenance and appealing subject matter combined to propel the piece above the €1500-2000 guide to €3200 (£2860), where it was knocked down to a private buyer in County Kildare. 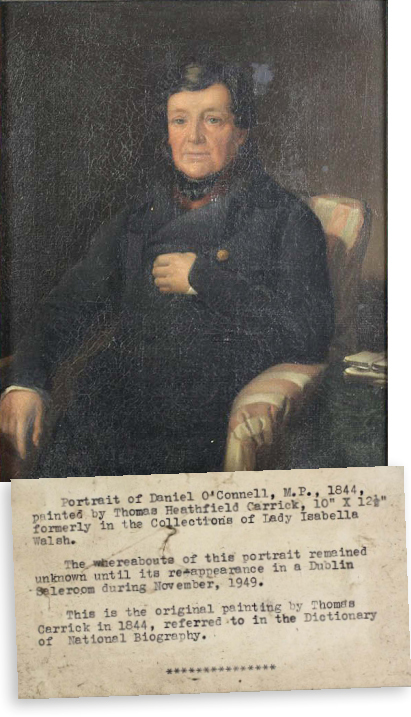 Portrait of Daniel O’Connell, ‘the Liberator’, by Thomas Carrick, with the label attached to the picture shown in detail below – €4000 (£3570). Another lot with plenty of Irish appeal was a portrait of Daniel O’Connell (1775-1847), a champion of Catholic emancipation. Known as the ‘Liberator’ of Ireland, he is depicted seated in a green overcoat. The 10 x 12½in (25 x 32cm) oil on canvas was painted in 1844 by Thomas Carrick (1802-75), a foremost artist of his time, who also invented a method of painting on marble. According to an old label on the picture, its whereabouts remained unknown until it reappeared in a Dublin saleroom in 1949. It was secured by a private buyer in Dublin on bottom estimate for €4000 (£3570). 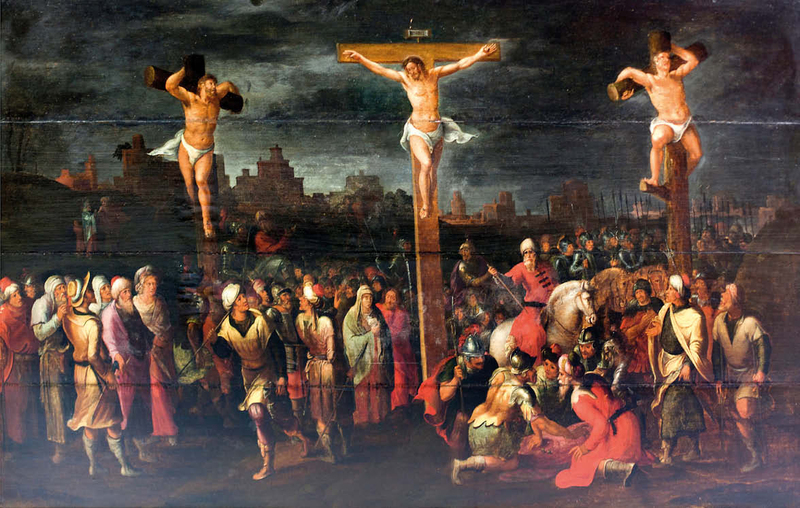 Golgotha, the crucifixion on Mount Calvary catalogued as ‘Flemish School, 16th/17th Century in the Style of Louis de Caullery’ – €12,000 (£10,710). A large painting depicting the crucifixion of Christ on Mount Calvery found interest. Catalogued as ‘Flemish School, 16th/17th Century in the Style of Louis de Caullery (1580-1621)’, the large, 3ft 1in x 5ft (95cm x 1.52m) oil on panel depicts Jesus to the centre with a multitude of figures below including soldiers, women and children, and the city of Jerusalem in the distance. From a ‘long-established private Irish institution’, it sold for a mid-estimate €12,000 (£10,710) to a private Irish buyer. It can be compared with a smaller scene catalogued as ‘circle of’ de Caullery that sold at Christie’s Amsterdam in April 2010 for €15,000 (£13,270).